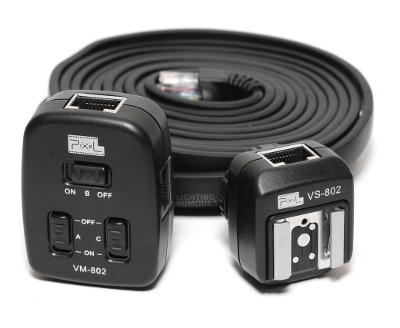 Pixel Enterprise have unveiled a TTL cord system that connects together by means of common ethernet cables. We try it out. TTL cords have been around for a while now. While genuine Nikon or Canon ones cost silly money, there are Chinese knock-offs that mere mortals can buy for less. One of the problems with nearly all TTL cords, though, is they are fixed length. What if you want a dependable connection in the studio, but your cable just isn’t long enough? Or you’ve bought one of those nifty ten metre cords only to find yourself tripping over it when you need it to cover an event? Pixel Enterprise have come to the rescue with the rather clever Componor Combined TTL Cord. The system comprises a “master” VM-801 module on your camera and a “slave” VS-801 unit on your speedlight. They are connected together via a standard ethernet cable. No proprietary sockets here! This has been a DIY hack for a while, but only now has a manufacturer come up with an off-the-shelf solution. The manufacturer sent us a sample copy of the VF-802 for Nikon to review. The Componor we received comes with a 4m long, high quality cable in the box. Need something shorter for run-and-gun events photography? No need to order specially from Pixel (though 0.3m and 2m kits will be available); simply poach the cable from the back of your network router, or buy a new one from the pound shop. Want something even longer? Ethernet cables aren’t expensive online. What’s more, there is not one, but three outputs on the VM “transmitter” unit and you can switch them off – A, B and C – at will. Obviously you wouldn’t want to get all tangled up in three cords when out and about, but it could be ideal if you need dependable speedlight synchronisation in the studio. Industry standard Prontor/Compur (PC) cords, by comparison, are notoriously unreliable and rather expensive to replace. For automatic flash use: camera flash systems aren’t designed to run multiple flashes on a TTL cord. As a result, only one of your three Componor wires can actually carry camera information at a time. The other two will synchronise manually. Luckily Pixel had this in mind, and you can pick which channel is the TTL one by way of the A/B/C slider on the back of the VM-801. Even if you are only using just one cord, the choice of three different angles for the cable is quite convenient. Plus, being able to “turn off” TTL means that users of the Nikon D40, D70/s and compact cameras can synchronise up to their maximum shutter speed without having to “neuter” any cables. The Componor feels pretty durable. The shell is strong and the switches reassuringly firm. Operation is foolproof. A bonus feature of the VS-801/802 is, when it’s not plugged in, you can use it as a coldshoe adapter. For working in a busy Edinburgh nightclub, the Componor ethernet cable included in the box was far too long. Instead, I borrowed a shorter cable from the back of my broadband router. If you don’t want to draw attention to yourself then you can try geting one in a colour other than yellow! There is only one VS-802 “slave” module in the box, but you will probably be able to buy them separately when the Componor is released. One of the annoyances with a straight cable is that you have to gather up the slack whenever you aren’t using the full length of it. Conventional TTL cords are often coiled like telephone cables, but these can get tangled up and be even more irritating. Also, some cables are stiffer than others, which will upset the orientation of your flash if you’re resting it on a table. A “wireless TTL cord” like the Pixel Knight can solve these cable-related woes, but makes a big dent in your bank balance. Focussing with your flash on a TTL cord can be a challenge in low light scenes. Perhaps the successor to the Componor could have an autofocus assist lamp on top of the camera? 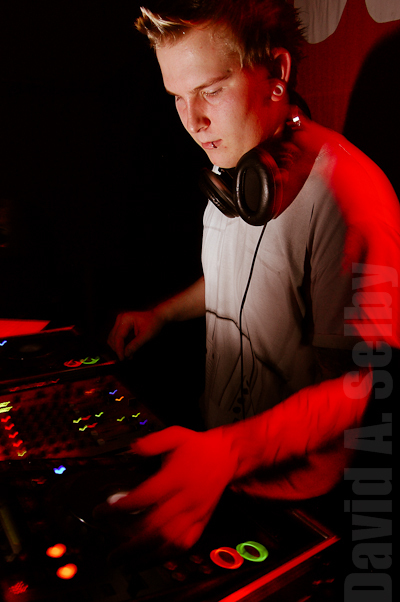 In the image above, a Nikon SB-600 rested on the table in front of the disc jockey, to the left of the camera. The red comes from the stage lights. Getting your flash off the camera is a real boon. No number of plastic accessories on your flash head will enable you to light your subject from behind as in the photo above. 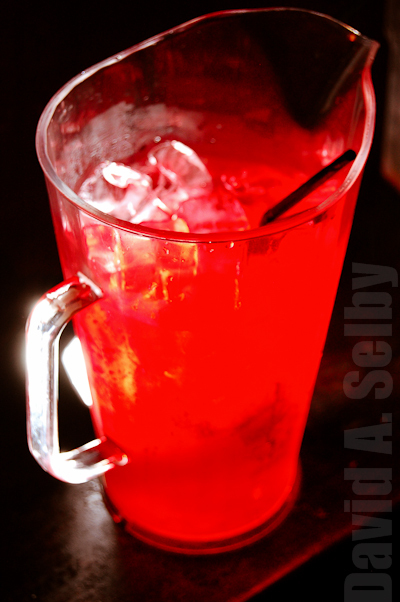 The Nikon SB-600 is in the frame, firing through the pitcher. Yes, you can use wireless triggers, but they need batteries, can suffer from signal interference and will cost you more if you want TTL function. Over the course of around 300 shots in one night, the Componors didn’t fail once. If you’re planning on buying a TTL cord in future, consider the Pixel Componor. Interchangeable, inexpensive, widely available cords are just a no-brainer. Why didn’t someone come up with this before? In stores soon, there will be three different kits – with a 30cm, 2m or 4m cable – at a recommended retail price of US$37.00, $42.00 and $51.00 respectively. Extra VS-801 and VS-802 slave units will be available for $14.00 each. Based in Paris, France, David Selby is editor of Lighting Rumours, a part-time photographer and a quantitative analyst.